Natural & Artificial Flavor, Citric Acid, Calcium Silicate, L-Tartaric Acid, Sucralose, Hydrogenated Vegetable Oil, Silica, Silica, Acesulfame K, Sodium Copper Chlorophyllin, Salt. Jan 23, 2015 Creatine is BROKEN.. and Your Pre Workout is to Blame. Note: This product has been updated a few times since this page was written. Please see our MTS Clash blog post for the most up-to-date information. Long story short? This is now one of our favorite "one-scoop-wonder" pre workouts! Clash is the brand new, no-frills pre-workout from Marc 'The Machine' Lobliner's company, MTS Nutrition. The company's first pre-workout, Clash aims to cover all the basics of pre-workout nutrition. No proprietary blends, no pixie dusting or label fluff, no playing games with label claims. Just proven doses of authentic ingredients that help you achieve your fitness goals. In 2011 Marc Lobliner decided he had enough with industry-wide "games." Companies were filling products with unproven ingredients and useless filler, while hiding ineffective doses of good ingredients behind deceptive proprietary blends. The pre-workout category has been one of the biggest victims of nefarious business practices. That's because it's so easy to load a product with stimulants you can feel immediately, while skimping on ingredients that will actually help you build muscle. They also pack products with cheap fillers just to take up space. A quick glance at the label shows that clash has just six ingredients, making up a total of 8g per scoop. The starting serving size is 1 scoop, but as is typical of pre-workouts, reaching an optimal dose requires 2 scoops. Creatine is one of the most well-researched performance enhancers on the market. It's utilized as a part of the ATP cellular energy generation process, leading to profound increases in endurance and muscle building. A supplement regimen that doesn't include creatine would be lacking. Beta-alanine provides a significant endurance boosting effect, reduces fatigue, reduces fat mass, and increases lean mass. This industry stalwart finds its way into many pre-workouts, but is often underdosed. You won't have that problem with Clash. The product includes the full dose that has been studied for these benefits. If you notice a tingling feeling after taking Clash, it's a result of beta-alanine. A new but rapidly emerging ingredient on the supplement market, betaine functions within the body as an osmolyte, a compound that helps maintain fluid balance in cells. Due to cellular-hydration benefits, betaine can increase peak power output [10,12] and muscular endurance. [11,12] Additionally, betaine stimulates the IGF-1 signalling pathway, and increases the body's anabolic response to exercise. Its modification of cell hydration also leads to enhanced pumps and increased cell volume, which will further encourage a fuller muscular appearance and sensation. This addition should be synergistic with agmatine. With the increased catecholamine substrate pool from tyrosine, agmatine may further stimulate catecholamine release. 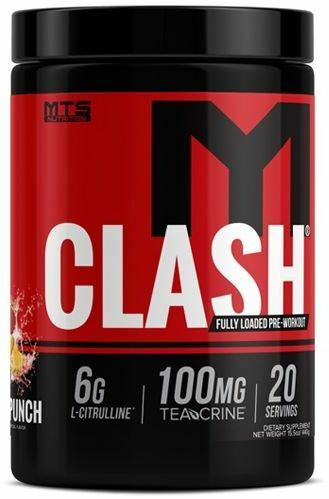 MTS Nutrition's first pre-workout, Clash aims to cover all the basics with proven doses of authentic ingredients. Need more caffeine? Check out MTS Ruckus! All of the ingredients in Clash have been used safely in humans at the same dose without major adverse effects. However, every individual's tolerance to a given ingredient varies and unknown drug interactions may exist. For this reason, always talk to your doctor before consuming this, and any other supplement. And never exceed the serving size directed on the label.